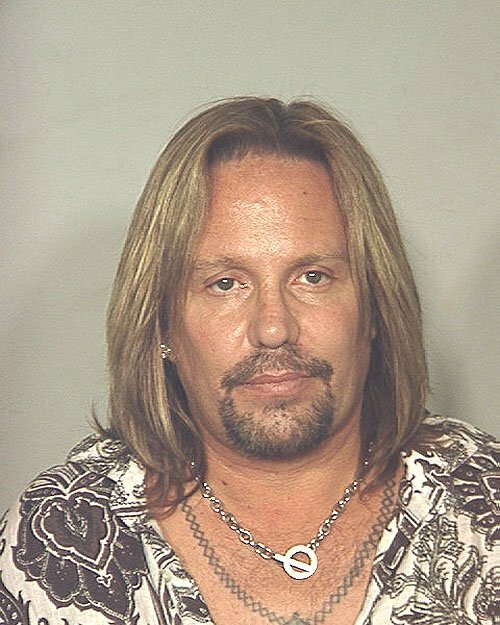 Vince Neil, Motley Crue's lead singer, was arrested for drunk driving in Las Vegas in June 2010. Neil, 49, was booked into the Clark County jail, where he posed for this mug shot. Submitted by rcmayo on Fri, 2011-06-03 09:16. Submitted by elimparcial on Wed, 2010-09-22 00:13. Submitted by mamalife on Mon, 2010-09-06 13:42. This guy never quits does he? Submitted by tomlouky on Wed, 2010-08-04 09:23. One would think that if one had killed a friend by drunk driving, one would get a clue. Noooo, not Vincent! He'll kill again.